Gannan went to live with his dad last week. It was his choice. He wanted to move out, wanted to leave. All week my thoughts have been jumbled and broken, my feelings mixed and shaken. There are so many ways, different angles, I could talk about what happened, so many lenses to look through. The question which is the right lens for the blog? I could postulate on the downfalls of contentious divorces and their effect on children. In that kind of post I would beg the members of divorce to work together for the sake of their children and not use them to get back at an ex spouse. I'd need to remind them that what they say about the other parent may be believed by a child at a moment when it wasn't best for the child. And although that may make the member feel gleeful and vindicated, where does it leave the child? If I chose to write about Gannan's leaving in terms of divorce I would have to include a discussion about how the rules of one house cannot possibly hold water if the other house doesn't fully support them. I would have to discuss the brain of an adolescent and how any 14 year old would OF COURSE choose to live at the house of least resistance, the house without expectations, the house where the very type of egotistical adolescent thinking is supported by a willing parent. And yet, this post could be written in so many other ways. I could ruminate on how the old "sticks and stones" saying is WRONG and words do cut right through you especially when said by a son or daughter. In that kind of post I would talk about how the most decisive mother can be easily turned into a vat of indecision when her choices, her words, done and said for the good of her children, make them loathe her...even for the briefest moment. It would discuss the virtues and downfalls of having specific expectations for your children, and how inevitably who they become, what they choose, is up to them. That kind of post would include how sad it makes a mother to watch her child struggle with wrong and right, and in the end make a choice that is detrimental to him or her. It would end with a description of the excruciating pain a mother experiences having to stand aside and watch a child learn the hard way. Then again, an even more difficult (and maybe more controversial) blog post would be a discussion of the indignation moms sometimes feel. 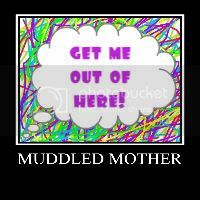 I may carefully admit to occasionally being tired of the challenges mothers face. I'd marvel at strong women who have equally challenging children who seem to get it right all the time. I may ruminate on the impossibility of being "on" all the time, and the guilt mothers feel when wanting, needing a break. I may even admit that I know some moms including me who when dealing with a sassy centric adolescent think to themselves or even say out loud (even though it isn't politically correct) "After all I have done...how dare you!" Of course there is always the more satisfying, perhaps easier angle, speaking about the incredibly supportive women I have in my life. In this kind of post I'd talk about how ALL mothers need a posse to surround them. Not a "yes ma'am" posse, but a group who tells you like it is each time you come to them to sound off or for advice. To have this kind of posse means that when you make wrong decisions, you'll know it and when your decisions are ones that they themselves would make you'll know that too. Maybe while penning this post I'd tell you specifically about some of my posse members. First, I'd introduce you to the J's...Jeanne and Janel. These ladies are my sounding boards for different reasons, but both essential in my life no less. Their no nonsense manner and logical thinking help to buffer my tendencies to react emotionally. If I decided to stick with the specific I'd tell you about the day after Gannan left. I'd let you in on the sheer and agonizing pain I was feeling and how one sentence from them...one specific sentence that they both uttered let me off the hook just a little, alleviated my guilt and anguish just enough to get me through the rest of the day. I'd also tell you about Mindy who lets me be my emotional reactive self. She probably has no idea how her kind phrase, "of course you are angry" made me feel a little less crazy--a little more sane that awful day after Gannan left. After all, someone in the universe understood why the anger was eating me alive. There are so many others I could tell you about but my posse wouldn't be complete without a mention of my sunshiney sister, Lanni, who mercifully but firmly works against my doomsday thoughts to remind me of the positives and the possibilities, guiding me away from the blackness into the light. I could speak in specific terms about the ugly scene that took place here. I could be really brave and admit to my readers how I lost my ever lovin' mind and sunk to 14 year old's fight level. If I really wanted to bare my soul, I'd get more detailed and tell you about the tug of war I had with Gannan...over a comforter...his comforter. I would tell you about the rage that took over every fiber of me when he used words as daggers knowing exactly what to say to tear me to shreds. I'd share the raw minutia of the car ride to his father's where he spewed on and on about how "he and his dad" felt about me. I'd cry as I wrote about how that alliance-whether in the moment or real and true-felt like a stinging slap in my face. But I'd also include a shaky-heart-in-my-throat discussion about the unbearable missing-him feeling I get in the quiet of the night, a feeling like a death, an empty hole in the deepest part of me. I'd divulge that I haven't slept more than a few hours since he left, lying awake wondering if he missed us, or his beloved little sister. If he felt any regret...any remorse, and wondering about the moment we'd be together again. Yes, there are many ways that I could write this post. However while contemplating which angle I would write about Gannan's leaving each way seemed to have it's own merits. Each way seemed utterly important to my weary mind. "Why not write about it all?" whispered the writer in me. And so dear readers, that is just what I did. I'm sorry. The sadness you must feel, I'm sure, is immeasurable. No mother should ever have to go through this kind of pain. Logan, I am soooo sorry! It doesn't matter how old your child is when they spew words at you that you thought would never come from YOUR child it hurts and it hurts alot. When mine did it to me I went to counseling and although it helped put things in perspective for me it still hurt. I learned to let it go. It has not been easy especially after Buzz died. Time is a great healer. This is the first post where I have actually sobbed reading it. The raw emotion of it killed me, but I love the brilliance with with you write in all the different scenarios to show how truly multi-faceted the situation is. As a mother, I cannot possibly imagine how you must feel, although you did give your readers a pretty good idea with your vivid descriptions. I am so sorry that this is just one more thing to have on your plate. I am amazed by your ability to still do all that you do. I hope writing this provided you some release. Lots of prayers and thoughts headed in your direction. Thank you for sharing your thoughts and feelings as if we, too, were part of your posse. I believe in my heart that you have given Gannan the tools he needs to succeed. He is going through a rough time in his life. He has chosen the path that he feels is right for him. Time will reveal to him if he made the right choice. All that you can do is what you've always done...be sure he knows how much you love him and that you are always there for him. I hope that he comes back to you, emotionally if not physically, sooner rather than later. I teach my Writers that a good piece of writing is cathartic. I can only hope that some how putting this into words will free you of some of the pain. I love you. I am so sorry for your pain. Its not easy being a mother. However, be patient, your son will come around. He loves you, even though his words stung at your heart. Know that he loves you, he always will. You are his mother. Forgiveness is a powerful tool. It has the capacity and the power to heal. Lean on God. He will carry you through this. I am just finding your blog. I don't know if your son has had a change of heart towards you. I hope so. I've read some of the responses and some made me laugh; because if you've never been through it, you don't understand it. I am an alienated mother. Just when you think the hits have stopped, someone throws another ball and the batter is up again. I am sorry for your loss and the hurt and the pain. I know all too well what it is like. I've been there. I am there.